This chapter of the Prague travelogue series covers the so-called Lesser Quarter, the west bank of the Vltava River south of the Hradčany Castle District, from the Charles Bridge to the old city wall high on the western hills. The first photograph, which I took during my first trip to Prague, shows this part of town. This visit was on a sunny afternoon in September 2000. 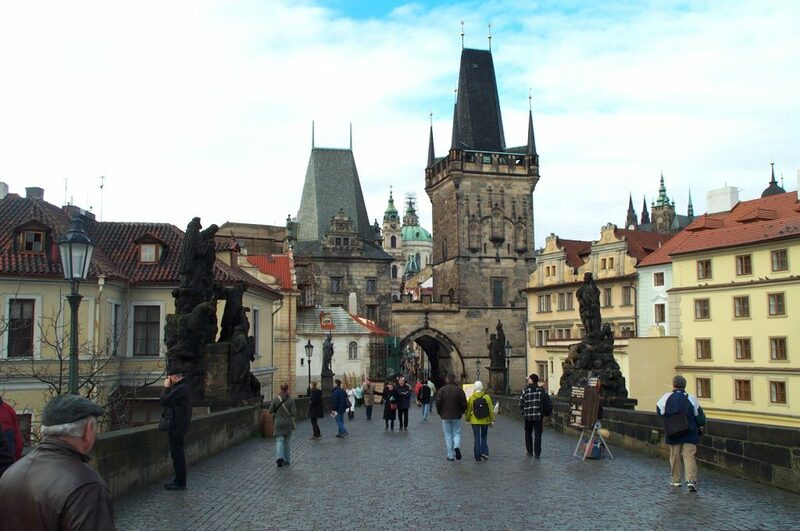 The Charles Bridge, or Karlův most, was the single most visited, most densely packed, and most active part of town. The bridge had about 30 figures lining both sides, many of them religious in nature. The figures were mostly stone but decorated with golden (brass) props. For example, midway down the bridge was a figure of Jesus carrying the cross where the cross was polished brass. 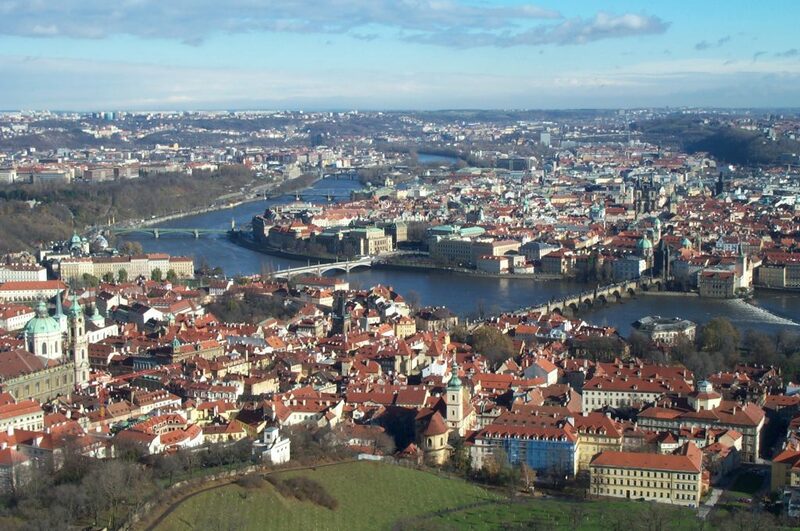 I took the picture from the Old Bridge Tower on the East Bank of the Vltava. It afforded me a view that was definitely worth the climb, and only cost a few krona (less than a US dollar). The bridge served both as music hall and art gallery. During both my visits, the bridge was packed with artisans of all types displaying their wares for sale. I recalled that most of them were sketch artists purveying scenes of Prague, but there were also jewelry-makers and woodcarvers. The street musicians there never seemed typical — classical and ethnic music was predominant. During my first visit, I listened to a violinist playing the classics with an audiotape accompaniment (he raked in the Czech krona). In my second visit, I listened to Irish and Australian bands playing traditional music with homemade instruments. Even though it was cold and windy on that particular day, massive throngs of people still flocked to the Bridge. While the east bank had more of the tourist kitsch, the west bank had the classier establishments that catered to the locals and the embassy crowd. The second photo shows the Lower Mostecká Tower that marked the end of the bridge and overlooked two squares off either side of the bridge with such establishments. In particular, the final statue on the left side of the photograph directly overlooked one large square with trees down the middle that has a half-dozen outdoor restaurants. That square seemed always packed during good weather. Beyond the Tower began was what I casually refered to as the Embassy District. It was where I encountered a number of embassies, particularly those of former Warsaw Pact states. The Embassy District was where I found more of the ‘classier’ crystal places that catered to the tourist crowd (as opposed to the definitely low-rate kitschier shops in Staré Město. The architecture was different, Mesto with more of its sidewalks in underpasses vice the purely outdoor-oriented style across the river. The one notable structure in that part of town was St. Nicholas’ Church, shown in the third photo at night. 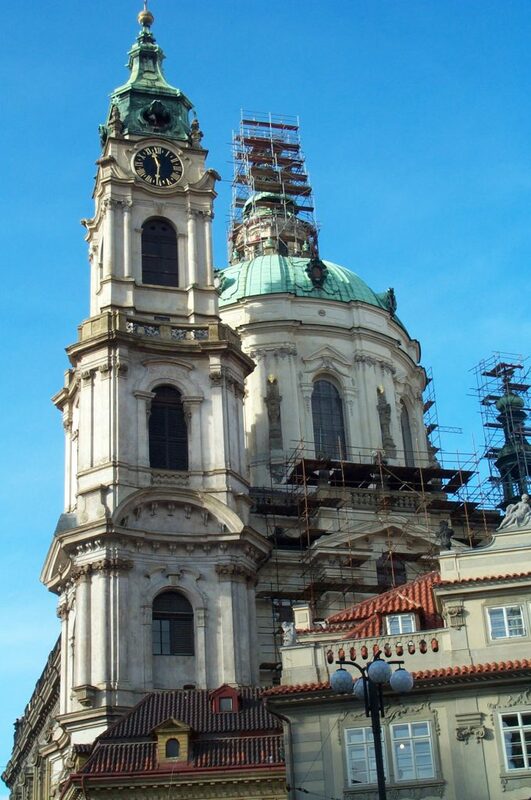 Like several churches in Prague, St. Nicholas was open to the public, but for a fee. The Embassy District had about a half-dozen churches, several undergoing extensive renovation. Beyond the Embassy District, I found two different paths leading up the hills. One path led to the Castle (discussed in the Hradcany chapter) or along a vineyard beneath the Strahovsky klášter, shown in the fourth photograph, and overlooking the Embassy District. The klášter (convent) was a fabulous structure, done up in brilliant white and containing a pretty church and a museum. The front side of the klášter had a series of vantage points with great views of the Old Town. But to really get a great view, I had to climb much higher on the hills, where I found the old city wall. The wall (Hladová zeď) was still very much intact and largely cleaned up, the old battlements still pointed outward to the south and west. Following the Hladová was a mostly steep road that passed by a Czech military garrison (which was still active), and leading to my target — an observation tower called the Rozheldna. That tower was easily identified from the Charles Bridge as it looked like a communications tower modeled slightly after the Eiffel Tower. The view from the top (about 60m above ground) was fantastic, as the fifth and final photograph attests. 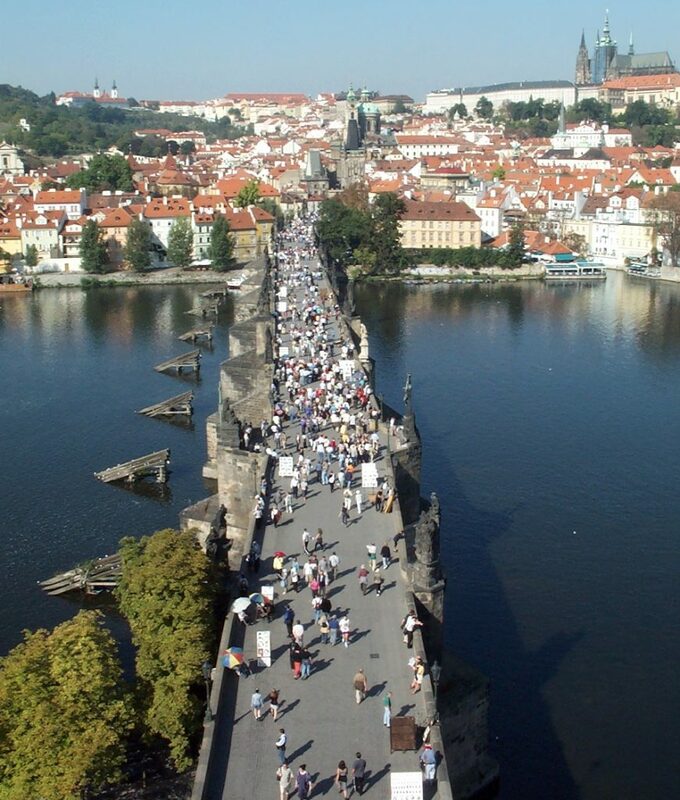 In that photo, the Charles Bridge was easily identifiable just right of center. St. Nicholas’ Church was also clearly visible at the left edge. The Rozhelda gave impressive views in all directions. Because the climb up the long hills was pretty tough, the city had another option available — the lanová dráha funicular train. The problem I found, however, was that the bottom station was located well to the south of the Charles Bridge which I didn’t consider being terribly convenient. The observation tower and old city wall weren’t the only things up there, by the way. The bludiště, or “mirror maze”, was a hall-of-mirrors constructed inside an abandoned chapel. Across from it are two other buildings of religious significance, one having a scene of Jesus leading the crusaders etched into the stone — very interesting. In all, the Lesser Quarter was “lesser” in name only. Most visitors would likely bypass this part of town and head straight to the Castle. My suggestion is to give it a shot if time is available.